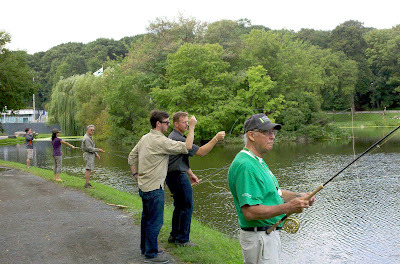 H: This past weekend, I attended a free switch rod class offered by my local Orvis store in NYC. I was very happy to hear that the class was being taught by Craig Buckbee, one of our favorite fly fishing instructors, a serious casting geek, and a really cool guy. 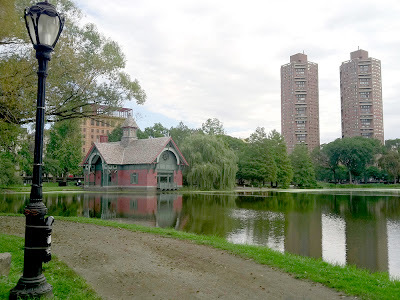 We met at the 106th Street entrance to Central Park by the Harlem Meer. There was a good turnout of 7 anglers, several of whom brought along their switch rods. Where else can you fish for bass, carp, pickerel, and sunfish in Manhattan. For a trout girl, who's been exclusively casting her 5 weight rod with floating line for the past 2 years, it was an eye-opening experience. Casting heavier, longer switch rods with shooting head lines is a completely different animal, all together. Heavy? Unfortunately, yes. Extremely powerful and versatile? Yes, yes, yes!! When Craig had mentioned Spey Nation earlier this summer, I thought: wait till you became a more experienced angler before attempting to learn a whole new casting genre. Boy, do I regret that decision now. Lesson learned in hindsight: you need to continually push yourself if you're going to become a better angler. Fishing the same rivers with the same outfit will only get you so far (not that there isn't a thousand things still left to learn there). But trying out new techniques, new equipment, in different environments, and going after different quarry is what's going to take you to the next level. We then moved on to a Circle spey, Snap C/T. I couldn't make the crisp tight loops that Craig demonstrated and my anchor didn't always end up where I wanted, but I know I'll get the hang of it with more practice. I can't wait to try it out on an actual river. Needless to say, my first attempt at overhead casting a switch rod was less than spectacular. I was afraid I'd overuse my bottom hand and end up swinging my rod like a baseball bat. I think that's exactly what I ended up doing, since I put an unintentional curve into my line on the forward cast, using both arms as a lever but not in a good (straight line path) way. But I was able to cast about 50 ft of line with just one back cast. I need to seriously hit the gym and pump up my casting muscles ; ). I consider myself to be fairly athletic but I know I won't able to overhead cast an 8-wt switch rod with a heavy shooting line all day long, even 2-handed. However, I will definitely be able to spey cast one for most of the day. I guess that's the beauty of the switch rod. 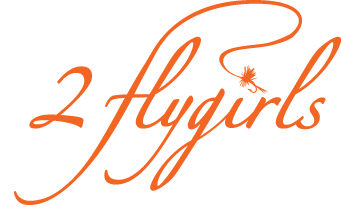 Note: Attempting to take their game to the next level, the 2 flygirls will be going striper fishing out in Montauk in a couple of weeks. 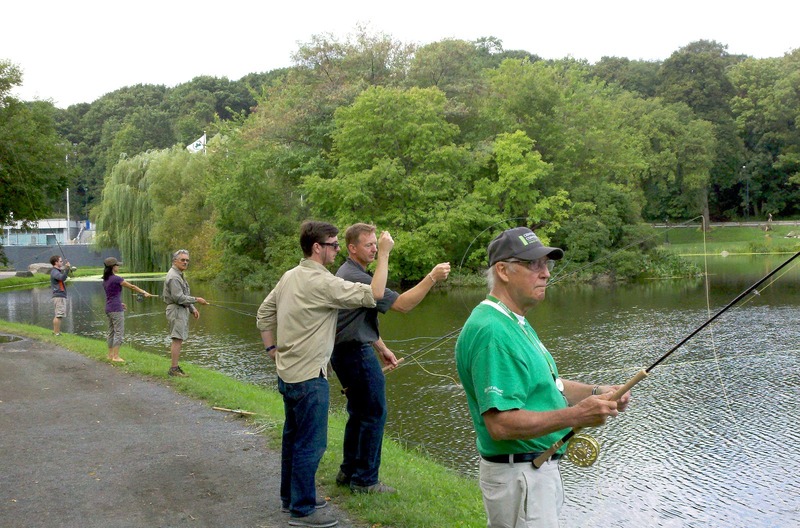 And maybe even try salmon fishing up in Pulaski for the first time, later this fall. Wish us luck! H: Since I wrote this post last year, I've been working hard to improve my two-hand spey casting. During this time, I've come to realize a few things. 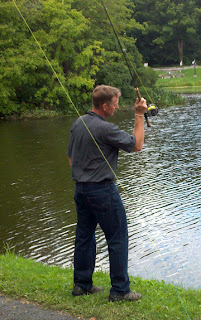 I believe it's easier to learn to spey cast with a real (12 ft+) spey rod. You have a better feel for the moves with a longer rod and heavier or longer belly line (I'd recommend a mid-belly). With a shorter, lighter switch rod, you're more likely to blow your anchor if you overpower the cast and you're much more prone to overusing your top hand. With a bigger heavier spey rod, you really need to power your forward cast with the lower hand or your line just won't go very far. You'll also quickly realize the importance of getting your core muscles involved during the cast, not just your shoulder and arm (otherwise, keep that bottle of Advil handy :). when are you going to montauk? Hi Rob, We are going to Montauk this weekend, Sept. 24th. Looks like we are going to get soaked! Good luck you guyz ! It was great getting to cast with you at The Meer. Hopefully you can apply some of your new knowledge while you're out on The End. Here's to "interviewing" some fish ! If we go, I will definitely be bringing my wetsuit. Maybe I'll try some skishing (spell? ).